The main strategist of Donald Trump's victory in the 2016 elections is the alternative conservative Stephen Bannon, who was removed by the president in August 2017 from the White House, in order not to tease the American establishment once again, has now become the subject of an investigation by the US Senate special committee. Senators who have a grudge against Trump want to find out what is known to the successor of Paul Manafort as head of Trump's election campaign about the links between the presidential entourage and Russia. This investigation is particularly piqued by the fact that when Bannon was summoned in January 2018 to testify on the same topic at a private meeting of the House Intelligence Intelligence Committee, he refused to answer relevant questions, citing the ban of the White House. The Trump administration denied that such a ban exists. Thus, Bannon, who is angry with both Trump’s globalist opponents and the president himself, since there is no prohibition or no, can well say something. The senators, according to Reuters, want to ask him questions about contacts with Russian representatives of Trump's former headquarters advisers, George Papadopoulos and Carter Page. Yes, almost all the people around Trump in recent years, people have already received the prefix "ex." Many of them have become “clients” of special prosecutor Robert Muller. Someone made a deal with the investigation, some still hold on, although they are already judged, hoping that Trump will still help them out. Democrats, in whose interests all this is being done, are just waiting for the failure of the Republicans in the midterm elections to begin the procedure of impeachment. 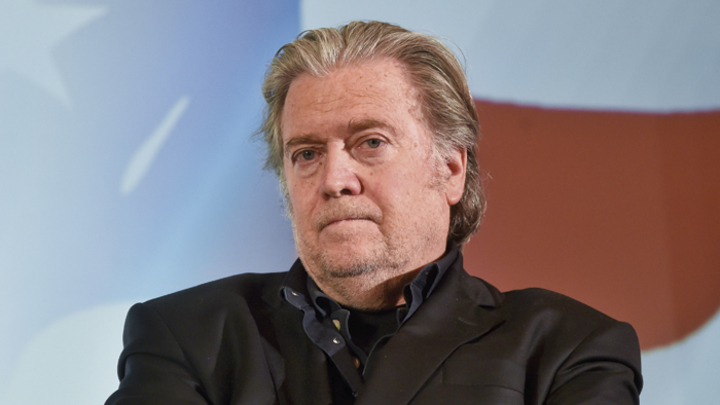 In addition, the Senate Special Committee intends to study the role of Bannon in the activities of the analytical company Cambridge Analytica, which managed to develop an innovative algorithm for analyzing political preferences of voters, thanks to which Trump's election campaign, which no one took seriously, was a great success. It looks like this is about trying to pin Bannon himself to the wall so that he can “sell” Trump. The interrogation of Bannon, reportedly, will take place at the end of November and will take place in an environment where Trump’s political position due to the expected failure of the Republicans in the midterm elections will be seriously weakened, and his impeachment will be put on the agenda. It will take place after Bannon has twice talked for the same reason with the people of Muller. However, it was especially disappointing, despite the feeling of relief, that Bannon was to part with the White House, as he and the strategy proposed by him - the promise to return America to its people - made Trump the US President. Although ungrateful Trump tried to downplay Bannon’s influence on his success. His separation with Bannon occurred in two stages. In April 2017, under pressure from the security forces and representatives of the traditional republican establishment in his entourage, Trump deprived Bannon of permanent membership in the National Security Council, which seriously “cut the wings” of his influence on the agenda of his administration. Having no own team at all and being isolated in the American establishment, Trump, for his political survival, was forced to rely on less extravagant figures than Bannon, first of all the military. In the face of the furious resistance of the globalist establishment, diverting his attention to Russia with his ostentatious and senseless Russophilism, Trump nevertheless set about implementing his election program, which Bannon helped him develop. Of course, since then much has fallen into place, with the exception of the economic front, where Trump managed to push his line. But the people who crossed Bannon’s road are very vindictive. Therefore, it cannot be ruled out that if punished for being close to the president and influencing him, Bannon will deny Trump his loyalty. The possibility of such a development of events is indicated by the fact that there was already a recurrence of disloyalty to Trump after all the attacks on Bannon. If the first months after being removed from the White House, Trump periodically called and consulted with his former adviser, then their relationship went completely wrong. Especially after the publication of the book by American journalist Michael Wolff's "Fire And Fury. Inside The Trump White House", which is based, according to the testimony of its author, including the testimony of Bannon. It appears from the book that Bannon was against Kouchner and Manafort meeting in June 2016 with Russian lawyer Natalia Veselnitskaya, who allegedly promised to provide Trump’s team with compromising materials on Clinton, calling their actions “traitorous” and “non-patriotic”. In general, the book contains a lot of unflattering comments about the Trump administration, which Bannon called "Full of lies and distortion." The White House statement even claimed that Bannon had "lost his mind." Trump's legal team also threatened to bring a suit to defame a politician for defamation and violation of written commitments against former employers. All this indicates that Bannon has nothing to lose. He is objectively one of the most tempting figures, with the help of which it will be possible to get rid of the White House’s master, even if he doesn’t tell anything particularly compromising about him. Bannon is now demonized more than anyone else in Trump's inner circle. For many Americans - liberals and leftists - he is generally "Satan." Muller’s agents, bloodthirsty senators, congressmen and mainstream media will only have to work a little to sharpen and file the evidence of Bannon, and then pierce the disagreeable president.